LOS ANGELES - Feb. 28, 2019 - PRLog -- The United Premier Soccer League (UPSL) is excited to announce Lazers Soccer Club as a new league member kicking off with the 2019 Fall Season. Based in Garner (N.C.), Lazers Soccer Club will begin play in the UPSL Southeast Conference Mid-Atlantic Division, and will host its UPSL home games at Wake Christian Academy (5500 Wake Academy Dr., Raleigh, NC 27603) in compliance with UPSL Minimum Standards. United Premier Soccer League Mid-Atlantic Division Manager Andy Salandy said, "We really like Lazers Soccer Club and we welcome them to the UPSL Southeast Conference. Owner Cory Combs is committed to the young players in his community, and his club is doing some great things. We think he'll field a competitive side and has a lot of potential to be a special club. We wish Lazers Soccer Club well as it prepares for the Fall Season later this year." Cory Combs is Owner and President of Lazers Soccer Club. A native of North Carolina, Combs currently holds a USSF National 'D' Coaching License. Lazers Soccer Club Owner and President Cory Combs said, "The UPSL has a lot of teams now in North Carolina. The travel will be manageable because there are a lot of cities around Raleigh (N.C.), like Garner, that are all interconnected, so this is a tremendous time to get involved in the UPSL. We're going to give people in our community another option, because they may not want wants going on up in Cary (N.C.), and the UPSL is a high level of competition that we think will be right for soccer fans right here." Tyler Grissett is the Director of Communications for Lazers Soccer Club. Brendan Morgan is Director of Marketing & Sponsors, and Michelle Sims is Director of Match Day Operations. Lazers Soccer Club began in 2016 as a youth club and has grown to field seven competitive teams for both boys and girls and feature more than 100 players. The club plays in the U.S. Club Soccer-sanctioned First Flight League, will have its first North Carolina Youth State Cup participant this May. "It's about giving an opportunity to local players to continue to play at a high level, whether they play in college or not. That's big for us. It's gives our youth club an opportunity to have something to shoot for and also the local players who may or may not play in college, it gives them an opportunity to play local," Combs said. 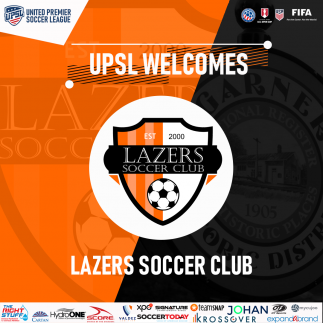 Lazers Soccer Club is an American Soccer club currently based in Garner, N.C., and a new member of the United Premier Soccer League. Lazers Soccer Club will play in the UPSL's Southeast Conference. Founded in 2016, Lazers Socer Club can participate in the qualifying rounds for the Lamar Hunt U.S. Open Cup through their affiliation and membership with the UPSL, the U.S. Soccer Federation (USSF) and the United States Adult Soccer Association (USASA).